Please take a moment to read the following policy to learn how we handle your personal information. Our website does not automatically gather any personal information from you, such as your name, phone number, or e-mail address. OnPoint Legal Research logs http requests to our server. These logs capture computer information, navigation and clickstream data. Some of the information collected does not identify who you are. Other information, such as your domain name or IP address, may identify you depending on the naming standards followed by your Internet Service Provider. You may wish to ask them about their polices and practices. If you linked to the OnPoint Legal Research web site from another web site, the address of that web site. This information is used to help us make our site more useful to our audiences by learning about the number of visitors to our site, and by monitoring traffic patterns and the types of technology our visitors use. We do not track or record information about specific individuals and their visits. Visitor information is not disclosed to anyone except OnPoint Legal Research personnel who need the information for legitimate business purposes such as responding to a request. Security For site security purposes, OnPoint Legal Research employs software programs to monitor network traffic that identifies unauthorized attempts to upload or change information, or otherwise cause damage. Except for authorized law enforcement investigations, no other attempts are made to identify individual users or their usage habits. Privacy and Links to Other Sites OnPoint Legal Research web site may contain links to other sites. OnPoint Legal Research does not collect personal information for commercial marketing or distribution to any other organizations. Messages sent via the Internet can be intercepted. If you are concerned about sending your personal information to us via the Internet, you can use another method such as fax or regular mail. Where personal information is provided that enters a system of records, it is collected in compliance with applicable British Columbia law. OnPoint Legal Research collects, creates and maintains information for the purposes of promoting its consulting services and for education and newsletters directly related to its consulting programs. Information collected is only kept for the length of time necessary to fulfill the purpose for which it was collected. 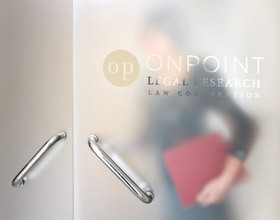 OnPoint Legal Research may disclose your personal information if required to do so by law or legal process. We may also disclose information about you if we believe that disclosure is necessary to protect the personal safety of OnPoint Legal Research employees, users of OnPoint Legal Research services, or members of the public. Contact us for more information or with questions or comments regarding this policy.